In the early 1990s, former North Carolina Gov. Jim Hunt (D) was on his farm in rural Wilson County contemplating his next steps after a successful eight-year term. One chilly morning, he noticed a small child wearing only a diaper with an empty bottle hanging out of his mouth, apparently alone. As governor, Hunt had made education one of his top priorities, but he had also heard from kindergarten teachers that children were arriving at school without foundational skills. Gov. Hunt decided he would run again for North Carolina’s top office, this time making early childhood initiatives a cornerstone of his administration.1 He was re-elected in 1993 and went on to launch the Smart Start initiative, which created a public-private partnership to fund early childhood programs in all 100 North Carolina counties. The state became a leader in early education as one of the first states to develop a quality rating and improvement system, or QRIS, to systematically improve the quality of child care. Gov. Hunt’s story demonstrates the power of a strong state leader with a clear vision for young children. Governors throughout the country have led the way in initiating preschool programs and early childhood initiatives, but much work remains to be done. The importance of early learning programs from birth to school entry has been well established,2 but U.S. policies and state and federal investment have not kept pace to reach all, or even most, vulnerable young children.3 With child care and early learning receiving renewed attention in the national debate, state leaders will be critical in the coming years to making the case and lead by example. This issue brief uses the term “early learning” to encompass home visiting, child care, and preschool programs. It is important to understand that the different terms used to describe these programs do not connote differences in need. In fact, children in their earliest years, especially those living in economically disadvantaged households, are best set up for success when they receive early learning services from birth to school entry. These programs make up what the authors refer to as the early learning continuum. Governors can become early childhood leaders by setting a vision for early learning and adopting it as a key agenda item. Through the power of their office, governors can direct attention to early learning and generate energy for action across their state. Governors can utilize executive orders and direct state agencies to ensure early learning programs are administered efficiently, funding streams are maximized, and the early learning continuum is inclusive of all children. Governors can also lead the charge to increase funding for early childhood programs and work with their legislature to prioritize state investments in young children. 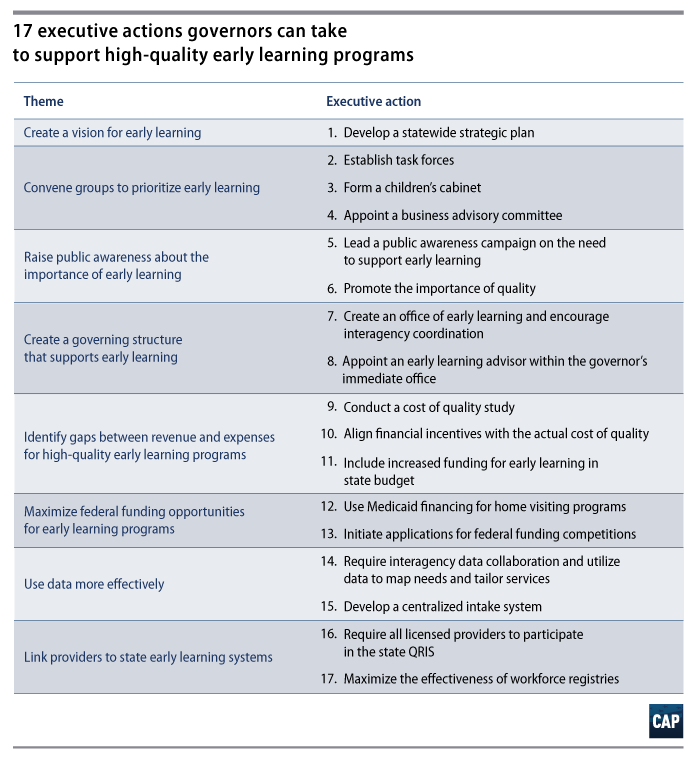 As governors consider their priorities, this issue brief provides recommendations on ways that state executive branches can support early learning programs. Children and families need broad, sweeping changes that make high-quality early learning programs accessible and affordable to low-income and middle-class Americans alike. Such changes will only come about with significant additional funding, which requires sustained commitment to early learning and state legislatures willing to pass budgets that prioritize early learning. While a governor’s power can be limited in this regard, there are still important actions they can take to signal the importance of early learning and lay the foundation for bigger change. In this issue brief, the Center for American Progress outlines 17 nonlegislative actions that support early learning programs. While not every recommendation is appropriate or feasible in every state, all are intended to present options for state executives who are committed to taking action on this critical issue. Governors’ first step toward realizing high-quality early learning in their state is to lay out a vision and plan for a comprehensive early childhood system. They can accomplish this by developing a statewide strategic plan. The strategic planning process should be inclusive of diverse early childhood stakeholders, including advocates, policymakers, parents and teachers, and community leaders. Incorporating multiple stakeholders will ensure that the plan considers the needs of children and families and is responsive to diverse communities and each of a state’s regions. This can help state actors work efficiently toward a common goal and create buy-in for the strategic plan. In 2011, California Gov. Jerry Brown (D) convened a State Advisory Council on Early Learning and Care to assess his state’s current early learning landscape and identify the needs of children and families. More than 2,700 stakeholders engaged in the plan development process, including parents, providers, and state and local agencies. The council’s Comprehensive Early Learning Plan, published in 2013,5 was intended to create greater coherence among early learning programs in the state. It constructed a vision for an effective early learning continuum and offered core recommendations for how this vision could be achieved. Governors need to convene policymakers, administration officials, early learning program leaders, and others to prioritize early learning across their state. They can do this by establishing task forces, forming a children’s cabinet in their administration, and appointing a business advisory committee. Governors can convene task forces to develop a strategic plan or address a pressing early childhood issue in their state. Typically, a task force meets for a specified period of time and concludes with the release of a report detailing its findings and recommending next steps. In the past, governors have used task forces to develop recommendations for early childhood workforce compensation, early literacy, the development of early learning guidelines, and increasing the quality of current programs. Generally, a task force is comprised of public and private stakeholders, including administration officials, early learning program leaders, advocacy groups, parents, civic and business representatives, and policymakers. Alabama Gov. Robert Bentley (R) created a children’s cabinet by executive order in 2016.10 The cabinet serves as an advisory body on issues that the state’s children face—formulating policy solutions and encouraging innovation.11 The cabinet focuses on developing a comprehensive strategy to early learning through a uniform approach to data collection, quality assurance, and outcomes measurement.12 The governor chairs the cabinet, which also includes the state superintendent for education, the commissioner for mental health, and the executive director for youth services. Ensuring children can access high-quality early learning benefits the economy in two main ways: First, it supports children’s development and, in turn, prepares children to be productive future workers. Second, it supports the current workforce by allowing parents to continue working. Business leaders can be strong advocates for early learning programs by highlighting these economic benefits.13 Governors can elevate the business case for early learning through appointing a business advisory committee. Governors should focus on raising the public’s awareness of early learning efforts. They can do this through leading a media campaign and promoting the importance of high-quality programs. As a state’s top executive, governors have a high profile in the media and with the public. They can use their profile to draw attention to early learning and signal that it is a priority for their administration. Such activities might include visiting classrooms, holding press conferences, or addressing early learning in the annual State of the State address. To elevate the importance of early learning for children, families, and the broader community, the governor can direct state agencies to develop a public awareness campaign, which can include ads on public transportation and billboards as well as public service announcements. Such a campaign might focus on child development or on how early learning programs support healthy development. States can target advertising materials at locations such as doctors’ offices or social services agencies where families might participate in the Special Supplemental Nutrition Program for Women, Infants, and Children, or WIC, or employment and job training. The executive branch can also take the lead in promoting the importance of quality in early childhood programming. Almost every state now has a QRIS to measure and support quality. The executive branch can lead a public awareness campaign to elevate knowledge about the QRIS among multiple stakeholders—providers, families, community and business leaders, and school district leaders—so that they better understand the need for and importance of quality, as well as the necessity of the QRIS as a mechanism that helps programs achieve and maintain quality. Governors should create a governing structure that can support early learning both now and in the future. They can achieve this by creating an office of early learning and encouraging interagency coordination as well as appointing an early learning adviser to their staff. In 2004, then-Gov. Sonny Perdue (R) of Georgia created the Department of Early Care and Learning, or DECAL, to streamline the state’s early learning programs.22 By merging the work of multiple agencies,23 Georgia was able to house services and resources for children from birth to school entry in one department,24 allowing administrators to more effectively build shared systems that address issues such as professional development or program quality. Governors can appoint an early learning adviser to their staff to ensure that the issue is a priority for their administration. This adviser can be a voice for early learning during budget and policy decision-making. Having a dedicated early learning adviser sends a strong message about the issue’s importance to the governor and the state. Because advisers demonstrate the support of the governor’s office, they can play a crucial role in ensuring successful coordination among state agencies and other stakeholders as well as work closely with any state task force, children’s cabinet, or business advisory committee. An adviser’s role only lasts for the lifetime of the administration, however, and should therefore be used as a supplemental mechanism to aligning state agencies. Governors should work to identify gaps between revenue and expenses for quality early learning programs. This can help states address the need for sufficient funding to support quality. To identify gaps, governors should conduct a cost of quality study. The results can be used to align financial incentives with the actual cost of quality and to justify increased funding for early learning in the state budget. A cost of quality study can estimate the cost of operating an early childhood program that meets specific state standards. It can be used in conjunction with revenue data to quantify any gap between current funding streams—such as child care subsidies, preschool initiatives, Head Start, QRIS financial incentives, and private tuition—and the actual cost of providing high-quality services. The process of conducting a cost of quality study includes identifying key cost drivers in the quality standards, collecting relevant data—including from providers—and developing a model to calculate estimated program and per child costs for different ages and settings, such as a child care center or a family home.26 These studies can be conducted by a state agency or by an external independent consultant or organization. Cost of quality studies can also be used to better align financial incentives in a QRIS with the actual cost of achieving and maintaining high quality. While many QRIS include tiered reimbursement—higher child care subsidy rates for higher quality programs—they are rarely tied to the actual cost of operating at high quality.28 Many QRIS also include financial bonuses or awards for achieving a high rating, but again, these are insufficient to cover the cost of operating at high quality and are usually a one-time award, which have a limited effect over time. Understanding the actual costs that providers incur at higher-quality levels—including increased teacher compensation—can help states target tiered child care subsidies and QRIS quality awards more appropriately so that programs are adequately incentivized and compensated for achieving high quality. These incentives can also include bridge to quality awards that help providers meet quality standards, rather than only rewarding programs once they have actually received a higher rating. Governors can direct their state agencies to use the findings from the cost of quality study to ensure financial incentives adequately reflect the cost to operate a high-quality program. 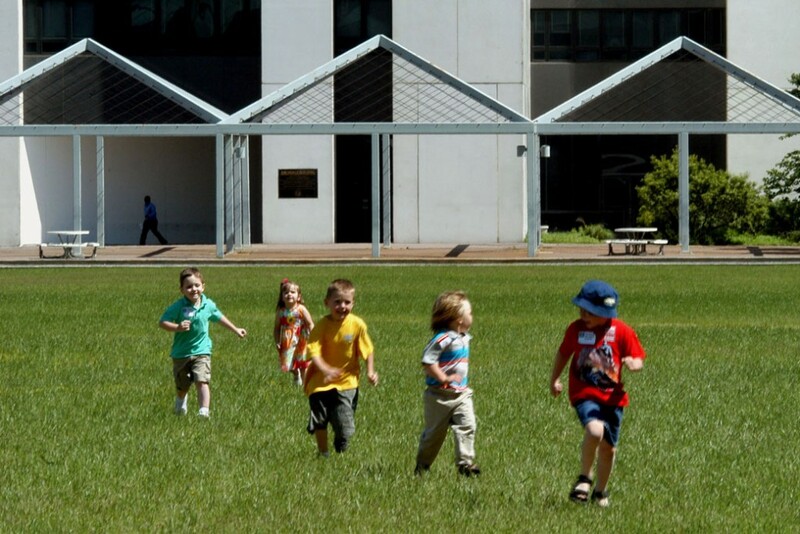 Public funding for early childhood programs is insufficient to provide services to all eligible children and does not support the cost of operating a high-quality program. In addition, low- and middle-income families are struggling to afford the high cost of private tuition.31 In order to ensure access to affordable high-quality early learning for all children, states need to increase their public investment. Governors can include a request for increased funding in their budget proposals and use the influence of their office to advocate for it with the state legislature. Governors need to explore the best ways to maximize federal funding opportunities for early learning programs throughout their states. Options include using Medicaid financing for home visiting programs and initiating state applications for federal funding competitions. Competitive grants from the federal government can provide funding to improve state early learning systems and to expand access. Governors can initiate applications and be supportive of state agencies in applying for and receiving these grants. By leading the charge on developing a vision and setting early learning priorities to which multiple stakeholders agree, governors can ensure that a state is primed and ready for funding competitions. They can also direct state agencies to review the requirements of previous grant opportunities and ensure that state agencies have up-to-date data on gaps in early learning and children’s needs that are ready to be incorporated into an application. Governors can also be a strong advocate at the federal level for expansion of these grant opportunities. Governors should strive to use data more effectively. They should require data collaboration between agencies and utilize these data to map needs and tailor early learning services. They should also develop a centralized intake system to streamline program eligibility determinations and referrals. Data collection is an important aspect in analyzing how and where early learning programs need to be expanded or where quality needs to be improved. Governors can direct state agencies to link data from early learning programs or to compile the data in one central repository. States can utilize these data to better map where children are located and where services are provided and to identify service deserts. By putting data from multiple programs in one place, state agencies, such as the departments of health and human service and education, can create a comprehensive picture of needs and gaps and can target supports appropriately. Governors should link early learning providers to state early learning systems. They can do this by requiring all licensed providers to participate in their state QRIS and maximizing the effectiveness of state workforce registries. The early childhood workforce is a critical component of high-quality early learning programs, but too often states lack effective policies to support them. A key step in addressing workforce issues is to fully understand the current early childhood workforce landscape. Many states utilize workforce registries, but most focus solely on tracking professional development.46 To develop supportive policy solutions and targeted professional development supports, governors should direct state agencies to ensure that workforce registries collect comprehensive information—including demographics, educational background, employment history, and salary information47—and require all early childhood workers to participate. States need to reduce barriers to participation and highlight the benefits of registries to the workforce. States should also ensure these registries are linked to other data systems, including child-level databases and the QRIS, to fully understand the links between the workforce, program quality, and child outcomes. Governors can assist in this effort by supporting the development of data sharing agreements across state agencies. Enrollment in Illinois’ early childhood workforce registry, Gateways to Opportunity, is required for all of the state’s licensed providers. The registry connects educators with professional development advisers; presents a clear career ladder; outlines core job competencies and requirements; provides scholarship opportunities for furthering education; and rewards licensed practitioners with supplements for pursuing higher education opportunities. Illinois has seen significant increases in both the number of educators with credentials and the level of professional credentials that educators earn.48 Moreover, in 2013, Illinois used its workforce registry data to inform credential requirements in its revamped QRIS. While states should ultimately work to expand and develop a workforce registry, this is a long-term solution that can take time to implement. As an immediate step, states can consider conducting a workforce survey to collect data to inform policy. A workforce survey can be used to collect wage, demographic, and geographic data to assess the current landscape of the early childhood workforce. Governors can be champions in efforts to improve and expand early learning opportunities in their states. This brief lays out 17 direct actions that governors and state executive branches can take; it is important for states to focus on the actions that will best address their specific early learning challenges. Ultimately, a substantial investment of new funds will be required for the significant expansion of early learning programs necessary to meet the growing needs of American families. Governors should take the lead in making the case for increased investment at the state and federal levels in order to expand access to affordable high-quality early learning programs for all children. Jessica Troe is the Policy and Outreach Coordinator for the Early Childhood Policy team at the Center for American Progress. Simon Workman is the Associate Director of Early Childhood Policy at the Center. The authors wish to thank Harriet Dichter, Joan Lombardi, and Katie Hamm for reviewing drafts of this issue brief and providing invaluable feedback and guidance. They would also like to thank Rebecca Ullrich and Rachel Herzfeldt-Kamprath for providing details on workforce and home visiting policies that governors can pursue.